Why Connect Your Devices to Alexa? Alexa is Amazon’s voice service and the brain behind tens of millions of devices like the Amazon Echo family of devices, FireTV, Fire Tablet, and third-party devices with Alexa native smart home voice user interface. Customers can use Alexa to control smart devices such as cameras, door locks, entertainment systems, lighting, and thermostats. By connecting your device to Alexa, you can increase customer awareness and engagement with your smart devices. You can use our native smart home voice user interface, features such as Alexa Routines and Groups, and more. And, you can certify your connected devices through the Works with Alexa program to ensure an intuitive, hassle-free experience, and to make it easy for customers to discover them online and offline. You don’t have to design a voice user interface, or VUI, when you use Alexa to control your smart devices; instead, you can use Alexa’s native smart home VUI, which makes your development and customer adoption easier. If the native smart home VUI does not cover all of your device capabilities, you can add your own custom voice intents without sacrificing the customer experience. You and your customers will also benefit as we make improvements and add support for more languages. We provide a range of options that help you build the way you want, whether that’s connecting your device control cloud to Alexa with the Smart Home Skill API, using Zigbee to connect locally, or connecting directly using the Amazon-managed hardware module and cloud service provided with the Alexa Connect Kit (preview). You can also build your very own Alexa Gadgets—fun and delightful accessories that pair to compatible Echo devices via Bluetooth using the Alexa Gadgets Toolkit. By integrating with Alexa, you can enable your customers to control your devices from any endpoint with Alexa built-in. Customers already own tens of millions of such endpoints including Echo, Echo Show, Echo Spot, Fire TV, and a wide range of third-party products built using the Alexa Voice Service. You can simplify customer use of your devices with Alexa Routines and Groups. With Routines, customers can trigger a series of actions from one or more devices using a single voice command, or automatically by time of day or in response to a sensor change or other device trigger. With Groups, customers can control the devices in the same room as an Echo device without remembering specific device names. You can connect your device cloud to Alexa using the Smart Home and Custom Skill APIs. Alexa alerts your skill when a customer wants to control your device, and your skill and cloud service then send instructions to your device over the internet. You can connect your devices to the new Echo Show and Echo Plus using Zigbee, or using other smart home hubs. Alexa communicates with the hub over the internet, and the hub communicates with your device. You can pair your devices to an Echo device using Bluetooth and the Alexa Gadgets Toolkit to build accessories that respond to what the Echo is doing. The Echo sends event information to your device, including timers, alarms, and text-to-speech (TTS) wordmarks. The Alexa Connect Kit (Preview), or ACK, is a new way to connect devices to Alexa without worrying about managing cloud services or complex networking and security firmware. Instead of the ongoing variable cost of running cloud services, with ACK you pay a low, upfront, fixed cost for the lifetime of the device. The new Mode, Range, and Toggle capability interfaces are now generally available in the US. You can configure these capability interfaces to model many different features, though they are particularly well-suited to device settings and modes such as fan speed, oscillation, auto mode, and many others. With the Alexa Gadgets Toolkit, you can build your own Alexa Gadgets—fun and delightful accessories that pair to compatible Echo devices via Bluetooth. 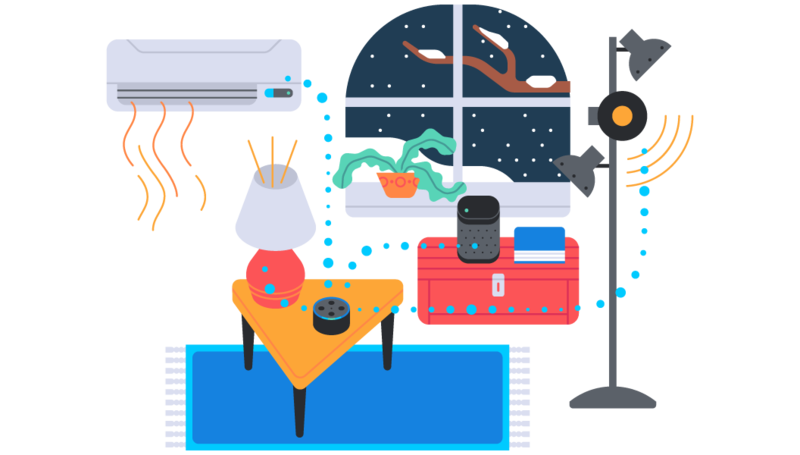 Alexa Gadgets extend Alexa’s capabilities to new modalities with motors, lights, sound chips, and more. Learn about the opportunities to deliver richer customers experiences for your connected devices using Alexa. Design a high-quality connected device experience with best practices, guidelines, and examples. Build with a range of software and hardware tools including APIs, SDKs, and hardware modules. Publish your skill to the Alexa Skills Store and certify your devices in the Works with Alexa (WWA) program.